My introduction to Wow! 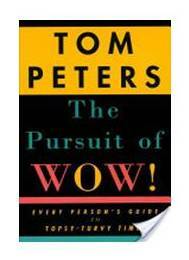 occurred many years ago when reading Tom Peters’ book the Pursuit of Wow. Peters extolled that in the face of ever increasing competition, businesses needed to create a way to stand out from the crowd; to cause your customers to say Wow! It can be as simple as handing me a hot cookie along with my hotel room key or as complex as designing “knock your socks off” customer service when I have a problem with your product. That read and reflection led me to consider how teachers can Wow their students and how school leaders Wow their staff’s. As I discussed the concept, I heard more and more stories of how educators do it. (Read about Everett School District in PA.) Those stories eventual lead to my book Wow! 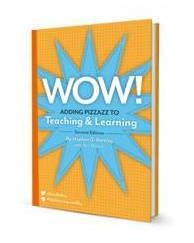 Adding Pizzazz to Teaching and Learning. He suggests five questions that help in planning for Wow. I believe they work for educators wanting to Wow students or teachers. Consider using these as you plan for the start of the upcoming year. What is the experience I want to create or transform into a WOW? How will the customer feel as a result of this experience? What specific expectations does the typical customer bring to this experience? What does failing to meet customers’ expectations for this experience look like? What does exceeding customers’ expectations for this experience look like? What are students expecting as they enter math class on the first day of school? One teacher surprises students by standing at the door handing each of them a dollar bill as they enter the room. As students sit with their dollar the teacher snaps his a few times and announces, “Here is the deal. Pass this class and you keep the dollar. Drop or fail the class you owe me the dollar back…with interest compounded daily.” The class proceeds with calculating daily interest at various dates of the year. During the year when a student is investing insufficient effort (no homework) the teacher pulls a dollar from his pocket and snaps it….with a smile… a friendly reminder. Here is how administration at an international school wowed their teachers. Following a year of change focusing on collaboration, assessment, coaching and teamwork, staff had been called for an end-of-year staff meeting on the final day of work and informed that the topic would be “Data Collection”. What do you think they were expecting? They arrived at the meeting room to find music (Kool & The Gang’s song ‘Celebration’) strobe lights, balloons, streamers, and Hawaiian leis. The room had been transformed with dozens of videos on laptops, photos, student reflections and artifacts representing the school year’s growth and development of coaching, teamwork and assessment. Colleagues were amazed as they wandered around, engage in reflective discussions triggered from the ‘collection of data’ that represented the school’s goals for the year. Staff had been encouraged to bring artifacts that demonstrated something in which they were proud and those became one of the many displays. Teachers enjoyed cake and toasted to their success as they saw evidence of the year’s hard work. Displays included a Wonder Table that was covered with index cards with questions such as, “Did you know that Grade Three switched classes on the 17th of every month – so each teacher went and taught another teacher’s class! Ask a Grade 3 teacher about it!” or “I have seen a great Grade 1 lesson where they show kids how to pick “a just right book”. Curious how they do it? Ask a Grade One teacher!” Teachers were also encouraged to add a question that they would like someone else to ask them about. Staff had the opportunity to celebrate, see what fellow colleagues had accomplished throughout the year, and reflect on the enormous impact they had on students. They were wowed and in many ways wowed each other. …you don’t have to make every experience in life a WOW. If everything is a WOW, then pretty soon, nothing is a WOW. But you must be able to identify which experiences you want to make a WOW, and then have a process—or a “technology”—for creating that outcome. …each successive WOW creates a new threshold for the next one. That’s the challenge of the Wow. Once I get the hot cookie and am wowed, when I don’t get them in the future I move to disappointed. After getting the cookie several times, it will take a new experience to reach Wow. Within an hour of the end of the year staff Wow, administrators were already discussing what they’d plan for the following year. I promise to pass on any Wow’s that readers share.